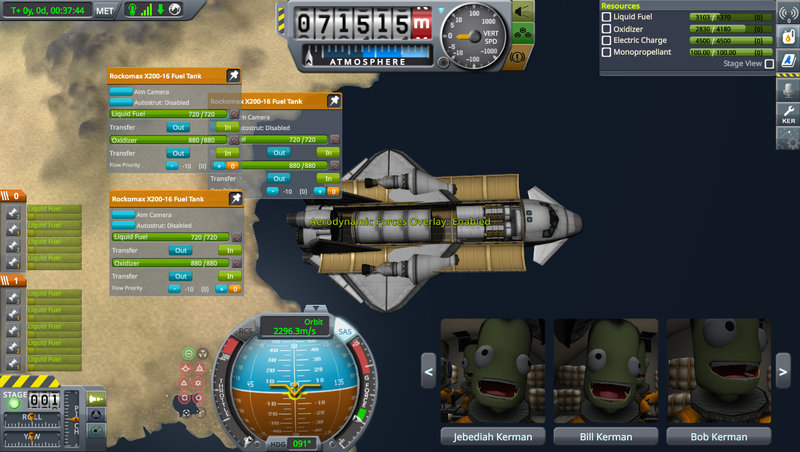 (Yet another) SSTO Spaceplane help request! I've looked around the forums. I've watched the Scott Manley basic tutorials and then the Mark Thrimm SSTO video. I've seen Matt Lowne land bricks. 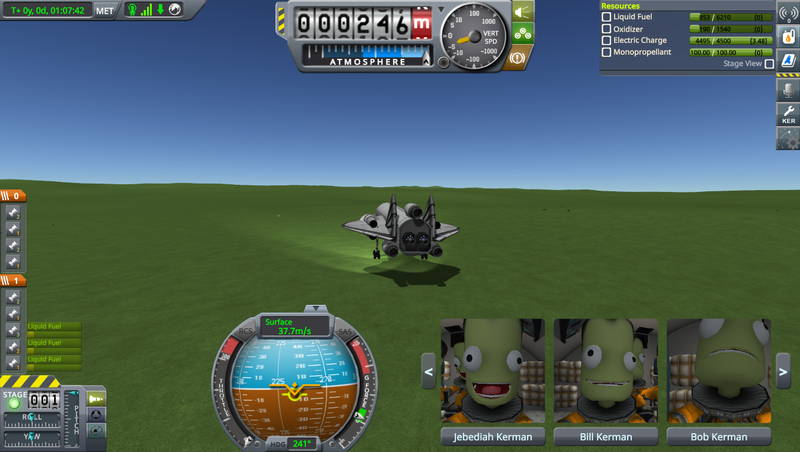 However I can't seem to build a spaceplane I can actually land. I find getting to orbit easy. Re-entry is hit and miss but if I can make it to below 600m/s things generally survive that bit. It's landing I can't seem to manage. 1) The small plane just won't manoeuvre despite using large control surfaces. If you come in perfectly straight and hit the chutes at the right time I've managed to land it but normally it hits too hard. 2) The big plane has far too great an angle of attack. If I add wings further forward it flips out on re-entry and is not recoverable (well, you can get it going straight with a quick blast in closed cycle mode but it won't turn even gently). It also has a habit of ripping its own wings off when decelerating. Action group 1 switches the intakes and the rapiers. MODS: There may be a SETI Probe Parts pod in the big plane. I think the small one is fully stock. Any help or pointers would be much appreciated! The crew plane reenters fine as included in the mod when I flew it, no issues there, though the reaction wheels make it easy to stall/over G accidentally if you aren't careful. It successfully reentered from 100 km orbit w/25 km Pe without a hitch, I kept SAS on Radial Out for maximum drag. I didn't land from space because I accidentally reentered at night. I tested landings by flying traffic patterns at KSC assuming half fuel and no oxidizer. It handled reasonably well at slow flight and landed safely at around 60-70 m/s, without parachutes, though it has far too much roll authority and as said before, you can accidentally stall if you aren't gentle with pitch. How are you flying the plane on approach and landing? What speeds, pitch, configuration, etc? The main gear is too far forward and too narrow, makes it easier to tailstrike and/or tip on an imperfect takeoff or landing. I moved them back and out a bit and it worked well. Nosewheel is fine. I replaced that bizarre reaction wheel setup with a cargo bay containing 2 reaction wheels, a small RCS tank w/ thruster blocks on the front and wingtips, and canards at the front. This keeps it nimble while also giving you some better space maneuvering ability. As a bonus you can keep your batteries safe inside. I also slightly shifted the forward wings back a bit to keep the CoM/CoL balanced. The craft has quite a lot of roll authority. Disabling roll on the inner elevons helped make flying (and landing) easier. Try playing with the control surface authority sliders in the right click menu. You can change them inflight to adapt to your situations. I also added a pair of airbrakes to make it easier to kill excess speed if necessary, though it performed just fine without them. All of these changes led to a safe reentry and landing at about 50-60 m/s on rough terrain (the desert). I can include the craft file if you want to see the changes I made. I'll test the other craft shortly. I didn't try it, but you can experiment with disabling reaction wheel torque before landing to make it a bit more predictable aerodynamically. OK, I don't have the mod, so I can't look at your big plane. Looking at your small one now. MK2 spaceplane parts have very high drag, which should always make it trivial to reenter them from orbit. If you are having trouble with reentry, then something is a bit wrong with how you are flying it. 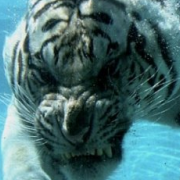 Your transition from MK2 to 1.25m and back again is very draggy. And it is near the front of your plane. As a general rule, high drag at the front of your plane will make it crash and kill all its occupants -- so you should fix that. Converting the batteries to 1K batteries and putting them in your nacelle stacks will reduce drag. Switching from the HECS2 to an MK2 probe core will reduce drag. Move the upper solar panels closer to the back end. Drag at the back end makes your plane more stable. With the reduced drag, You can get rid of the outer pair of nacelles/engines and the plane flies better. You've got to use the fuel storage in the Big-S wings! That fuel storage is one of the biggest free advantages that you get from any parts in the game. I'm a canard-wing fanatic, so I'd add a pair at the front. They really help. It's more effective to attach your nacelles to the main fuselage and then move them outward with the move tool -- rather than attaching the nacelles directly to the wings. The wings tend to break off when the nacelles are attached to the wings. If you can bear to do it, moving one of the crew cabins to the back end of the plane will balance your plane better during reentry when the fuel is gone. You can manually transfer some fuel to achieve better CoM balance on reentry if you like. It's a slightly tricky thing to do, but putting one or two degrees of incidence on your wings will also reduce drag going up to orbit, and makes your plane much easier to fly at low speeds. 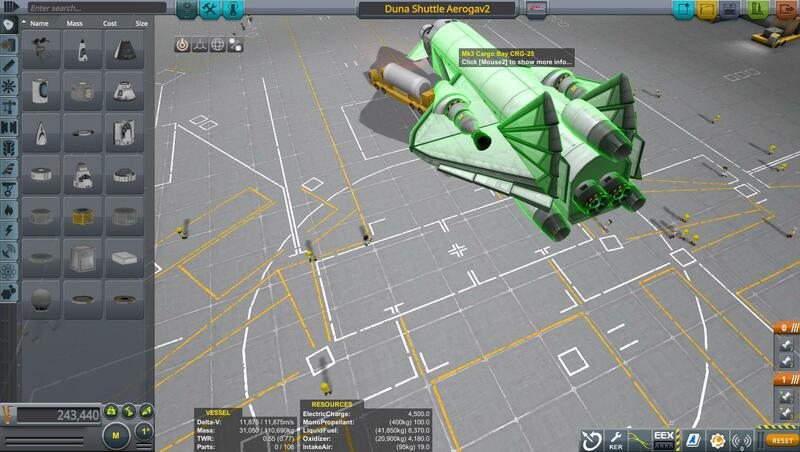 Do not place solar panels on the bottom side of an SSTO! That's the hot side on reentry, and those panels will usually blow the hell up. The nose of the plane takes the worst of the heat -- and there are more heat resistant parts than a pointy MK2 cockpit. If you use an MK2 inline cockpit, and then put something heat resistant in front of that, you can get better heat tolerances on ascent and reentry. Either that, or do as Razor235 said and maintain an extremely high drag reentry attitude until you are well below 1500 m/s surface speed. Thanks both for your comments and advice. Turns out it was around 80% my flying for the small plane. I moved the CoM a bit, moved the wheels back (harder to take off but easier to land) and got rid of the exposed reaction wheel/probe stack and put it in a cargo bay. I also messed with the control surface authority a little. I can now land it with a 40-60deg re-entry angle of attack from reasonable orbits. So long as I'm careful to line it up roughly right - get well below 8km just after the mountains - I can land it most of the time so long as I land at a low enough speed. The big plane is just fragile. I've removed the modded parts so it should work stock now. I've landed it a few times but its very sensitive to stutter it seems. if the game stutters in the low atmosphere there's some unfortunate unplanned disassembly. When I use it I have to save, quit, and reload - that buys 10-15mins before the stutter returns. I also can't really manoeuvre the thing - I have to line it up right. To be honest I'm happy enough with it for now but if anyone fancies taking a look and suggesting anything that could improve the strength I would appreciate it. I've spent a few hours with the big one. The main problem is it is simply too heavy for the 2.5m tank to fuselage joint, even a 2g pitchup maneuver causes breakup, can't imagine trying to land the thing in one piece. You could just swap the side pods to mk3 fuselage sections, but i was able to take a lot of the weight out of the ship in my version. Regards to weight, you've got a classic case of too many rapiers (which weigh 2 tons each), meaning high dry mass causing low delta v, which you then add more fuel to compensate, then more engines when it won't go supersonic etc. Yours was coming in at 250t laden, mine was 110 with same cargo. My rule of thumb is one RAPIER per 50 tons or so, one nuke per 30 tons, and some booster engines with good low speed performance to help it over the sound barrier. My version of your ship had 4 nukes, 2 rapiers, and 3 panthers. A 1:1 rapier/panther ratio might have been better. To make such an "underpowered" ship work you need low drag. The mk3 engine mount has a 2.5m attach node on the back which you are not using. Unused attachment nodes create huge drag, as do mismatched ones - attaching parts that are the wrong size for the node. Every node should end in something pointy. Jet engines (like Panther, Whiplash) are low drag, but rocket engines and rapiers are not because they have attach nodes behind them, which create drag if left empty. You can use the reverse cone trick to nix this drag from rapiers. Wings not angled up at 5 degrees. This means the whole body of the plane has to fly nose up to get lift, which greatly increases body drag. Note, if you angle the wings up (this is known as adding incidence angle) it is important to remember the lifting surfaces at the front must always have at the same or slightly higher incidence angle than those behind, otherwise you can end up with the rear wings stalling first and the plane going into an irrevocable deep stall. The second issue with the design was much harder to solve, it's what i spent most of my time on and sadly was only really able to Kludge it whilst retaining some elements of the original appearance. 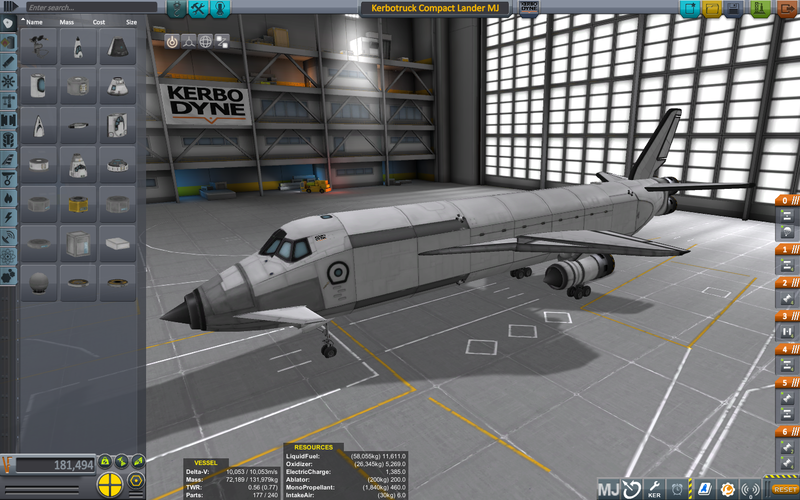 You see, those engines at the back designs look very sleek but don't really work out for a KSP cargo plane. Sure, on takeoff the fuel and cargo up front might balance out the heavy engines to the rear, but once you've burned your fuel off and unloaded stuff, it's going to be dramatically more tail happy for re-entry and landing. You either end up too nose heavy to fly efficiently (or at all!) on launch, or too unstable on the way back. Ideally, you want to balance the plane so its CG is in the middle of the cargo bay when empty. This is done mainly by shifting engines around. With CG centred on the cargo bay, there will be no shifts after unloading cargo. Then, add fuel tanks fore and aft, so that there are no changes with either oxidizer or jet fuel burning off. If you're really thorough you'll check each separately, especially on a beyond low orbit design with a lot of LF. Anyway, with my version of your plane, i had a struggle. I reduced the number of nukes and pushed them as far forward as i could without completely getting away from your layout. 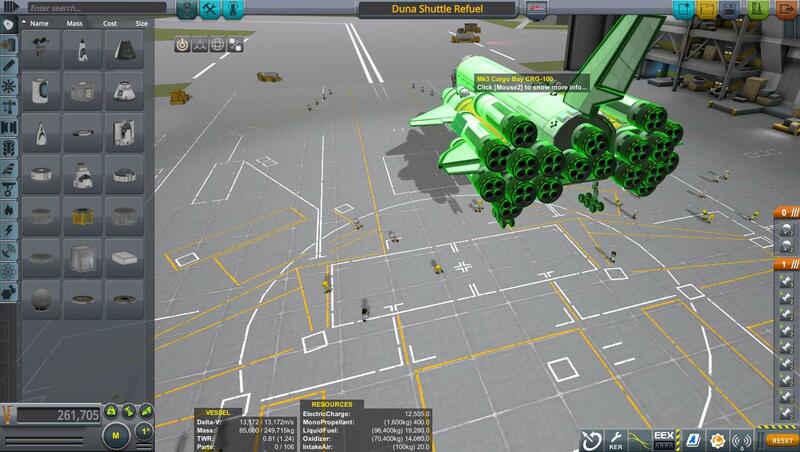 I had to find ways of getting more fuel in the back of the plane, without pushing the heavy engines any further back. Hence, the tail fins that are made from big-s strakes. I couldn't get fine enough control over fuel capacity fore/aft by adding mk3 tanks, so i just added more cargo bay and put jet and rocket fuel tanks within those. That's wasteful of volume, mass and drag but i suppose the only alternative, other than making another Skylon clone, is to leave tanks partly filled, which has the same drawbacks. Note that the panthers look like they are radially attached, but they are in fact on the mk3 engine mount's 1.25m nodes. I used the offset tool to make them look like nacelles (boeing 727 forever!). There's a 2.5m bicoupler on the central 2.5m node, which gives me two more 1.25m nodes on which to hang the rapiers, which are coned. Action group 1 - toggle nukes. Action group 3 - turns off the rapiers and nukes, switches panthers to non-afterburner mode. Useful if you need to fly around a bit after re-entry. Flight profile - climb subsonic to 5km, it will start to level off naturally at this point unless you yank the nose up to a draggy degree, so just hit the prograde assist and let it go through the sound barrier. Probably best to keep it on from that point anyway. At 1300m/s, start the nukes. At 27km, switch mode on rapiers. At 35km, remember to change Navball back to Surface mode to avoid flying with a negative AoA. Here is what I do. Since you are coming from orbit, you will have slowed down horizontally, but not so much vertically. What I do is one the flames go away, I will pitch up and down to slow down near a landing site (try to be kind of close to the ground) then fire up my engines until I have more horizontal velocity, then if I can touch down safely, I do, and if not, I just repeat the steps. Mach 6 is my launchpad. ...is capable of easily lifting sixty tons of payload to LKO. With six RAPIERs. You need enough engine to reach takeoff speed before the end of the runway. That's all. Minimise drag, minimise excess weight, build in a bit of wing incidence so you can keep the fuselage pointed prograde while you climb. Level off if necessary to break transonic, climb to about 15,000m for the speed run, crank it up to 1,500m/s then climb to 29,000m before switching the RAPIERs to rocket mode. Do it right and you'll still be at 1,400m/s or better when you switch over and carrying a fair bit of vertical velocity as well.